At long last, one of hip hop's most pioneering and creative emcees returns with a new album! 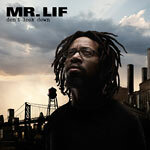 Mr. Lif's new solo project features Del The Funky Homosapien, The Perceptionists, Blacastan, Erica Dee, and Selina Carrera, as well as production from Edan, Fakts One, and more. Produced by Alex ''Apex'' Gale & Taylormade Sounds of Dejeous (track 1); Alex ''Apex'' Gale (2); Taylor ''made'' Rivelli (3); Caliph-NOW (4); StopFunkDust (5); Edan (6); Fakts One (7); Pas Doo (8); Synthetic Nation Music (9 &10).